If “superfoods” really exist, chicken breast has to be number one on the list. 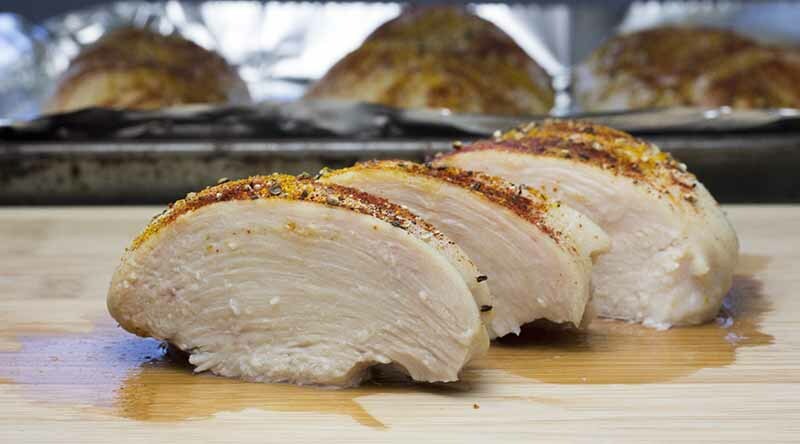 If you remove the skin and trim away any visible fat, chicken breast is 98% lean. It’s basically the ultimate low-fat, no-carb protein source. This is why knowing how to bake chicken breast in the oven is so useful. It also doesn’t hurt that chicken breast is the least expensive animal protein in most grocery stores. Just be aware that the really cheap chicken breasts are from caged chickens, so spend a little more and get good organic free-range chicken if you can. I eat A LOT of chicken breast. To be able to eat chicken this often, I have come up with a lot of different tasty chicken recipes. I have already shared a few chicken recipes on the blog, but today I wanted to show you how to bake chicken breast in the oven. I usually cook 4-5 breasts at a time and store them in zip-lock bags in the fridge until I need them. They will keep fresh for about three days. Cut away any visible fat from the boneless skinless chicken breasts. I always use a pair of scissors for this as it’s much easier than using a knife. Fill a large bowl with just enough water to cover the chicken breasts and add ½ tbsp. of salt for each chicken breast. Let the salt dissolve before adding the chicken breasts. 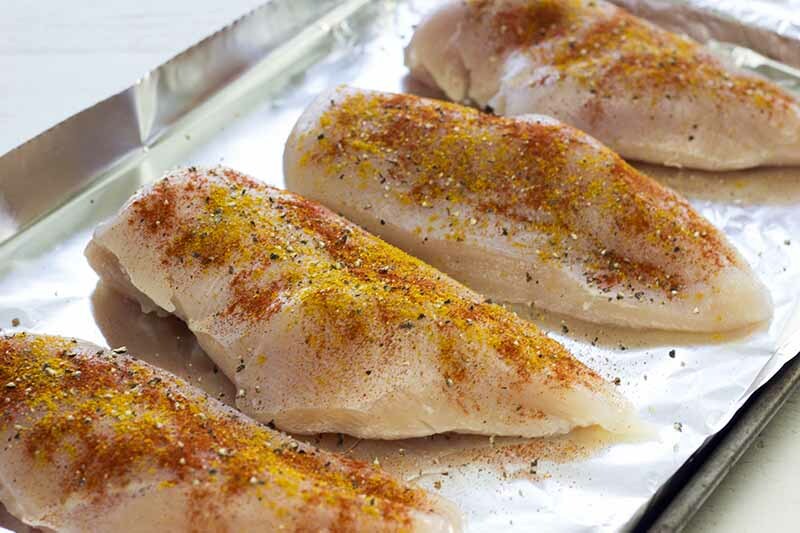 Leave the chicken breasts to marinate in the salt water for 1-3 hours in the fridge. This will draw water into the chicken and make it super moist when you cook it (this process is called “brining”). Rinse the chicken breasts thoroughly in cold water. Dry them with a paper towel and place them on a baking pan. Add your favorite seasoning. I usually use pepper, curry powder, paprika, and garlic powder, but you can use a wide variety of spices. Bake the chicken breasts in the oven for about 18-20 minutes at a 365 F (185 C), depending on the size of the chicken breasts (the ones I cooked today were large, so they needed 21 minutes). Cut into one with a knife to see if they are done before taking them out of the oven. Let the chicken breasts rest for 2-3 minutes after you take them out of the oven to lock in all the juices. That’s it! This is how to bake chicken breast in the oven. By cooking the chicken breast like this, you will get perfectly tender, juicy, and delicious chicken breast every time! Brining is, in my opinion, the easiest and most effective way to tenderize chicken breast and lock in the moisture. If you are worried about adding too much salt to the chicken, don’t be. Brining doesn’t actually add a lot of sodium to the chicken, as long as you only leave the chicken in the brine for a few hours and rinse it well afterward. Also, you won’t have to salt the chicken later for flavor. Q: Can I use frozen chicken breast? A: You can’t brine the frozen chicken breast (unless you plan to leave them in the brine for a long time while they thaw). You have to defrost the chicken before you start brining. Q: Can I use this method when grilling? A: Absolutely! I think brining is even more important for grilled chicken that tends to get dry easier than baked chicken. Q: Do I need to rinse the chicken after brining? And doesn’t that spread bacteria in the kitchen? A: I know that many cookbooks say not to rinse chicken for safety reasons, but you have to do it when brining. You need to get the brine off before cooking or the chicken will be too salty. Q: Do I have to put the chicken in the refrigerator during brining? A: I recommend that you do, but it technically shouldn’t be necessary, as long as you fully cook the chicken breasts. But better safe than sorry, right? Q: Do I need to cover the chicken breasts in the oven? A: No, I never do that. Q: Can I use bone-in chicken breasts? A: Yes, but you may have to bake them for longer. Test if they are done with a knife or cooking thermometer. Q: What does the internal temperature have to be if I use a cooking thermometer? A: The safe internal temperature of chicken is 165 F° (74 C°). Q: Can I marinate the chicken after brining? A: Absolutely, I often do that. Just don’t add a lot of additional salt. Q: Do I need to turn the chicken breasts in the oven while cooking? A: No, that shouldn’t be necessary unless your oven cooks very unevenly. Q: Do I need to put any oil in the pan? A: Only if your pan tends to stick to whatever you are cooking. I use a piece of aluminum foil in the pan to prevent that. Q: Can I use any kind of salt for the brining (like Himalayan pink salt)? A: Yes, any type of salt should be fine. You can also check out my list of the best low-carb chicken recipes. The possibility for healthy and yummy chicken recipes are endless, so there is absolutely no reason to settle for dry chicken. Not when you know how to bake the perfect chicken breast in the oven! When you’ve tried baking chicken breasts in the oven like this, please don’t forget to let me know how you liked them in the comments below! Follow this easy 3-step guide to bake the perfect chicken breast in the oven. You will always get a perfectly tender, juicy, and yummy result. 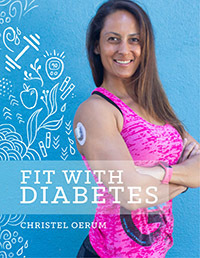 Cut away any visible fat and bones. I always use a pair of scissors for this as it’s much easier than using a knife. Rinse the chicken breasts thoroughly in cold water. Dry them with a paper towel and put them on a baking pan. Add your favorite seasoning. I usually use pepper, curry powder, paprika and garlic powder, but you can use a wide variety of spices. Cook the chicken breasts in the oven for about 18-20 minutes at a 365 F (185 C), depending on the size of the chicken breasts. Cut into one with a knife to see if they are done before taking them out of the oven. 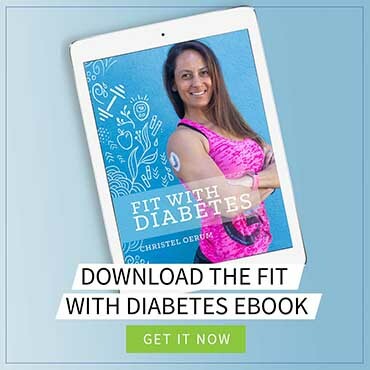 Previous Post: « Is Treating Low Blood Sugars Making You Gain Weight? We have used your recipe today and the breast was so delicious, what a nice recipe! And you are right, chicken breasts are one of our number one superfoods too. Thank you very much! Has anyone tried to cook this in an Air Fryer instead of the oven? If so, how long did you cook it? We haven’t, but if you do, please let us know for how long you cooked it and how it turned out. I eat chicken a lot but never brined because I really didn’t think it would make a big difference, all I can say is WOW!!!! My breasts must have been WAY bigger than yours. I baked them for 22 and they weren’t even half cooked. guess I’ll keep adding time until they are done. Can i brine the chicken in the fridge overnight ?? Yes, I do that sometimes. Just rinse it very thoroughly before cooking to get all the salt off. Would this brining method work for pork chops? Yes, pork chops are excellent for brining! Did you ever try this of beef? chuck steak for example to make it moister?? I was in awe at how perfect my chicken breasts came out. ” The chicken sat in a brine for about 2.5 hours in the fridge. I followed every step, and seasoned with some Mrs. Dash “Garlic & Herb. I baked the breasts on 265 F for about 20 mins, then let them rest. Had the chicken over a bed of rice with some steamed broccoli. Next time, I would like to try a buttermilk type of brine, and compare the results between the two. As far as this recipe goes. Five stars across the board. I have a daughter’s wedding coming up and need chicken chunks for stir fry, for 300 people. Can I do this brining method, cook it in the oven with spices on it, cut them up into chunks, then freeze them for the reception? Will they reheat juicy? I definitely do not want dry chicken for that many people. I believe so, but I haven’t tried it myself and I am not completely sure how brined chicken reacts to being frozen. For such an important even, I would definitely test it first with a small batch. 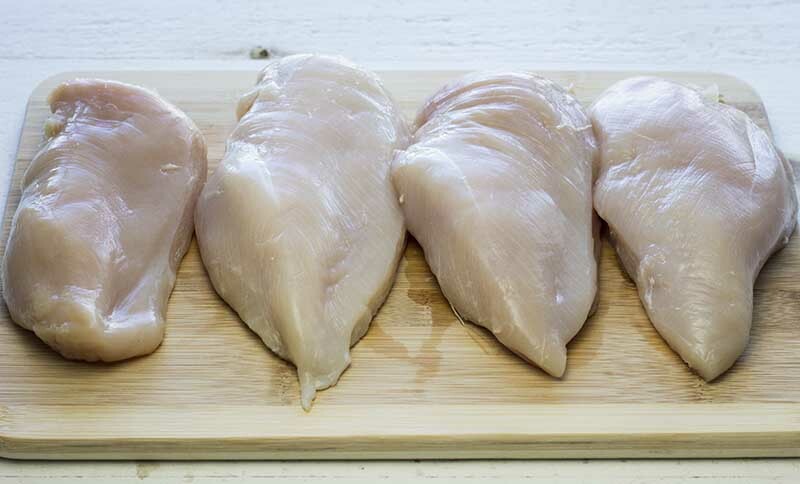 You should not wash or rinse chicken before cooking it. All you are doing is spreading bacteria and splattering contaminated water around the sink. You have to when you are brining. 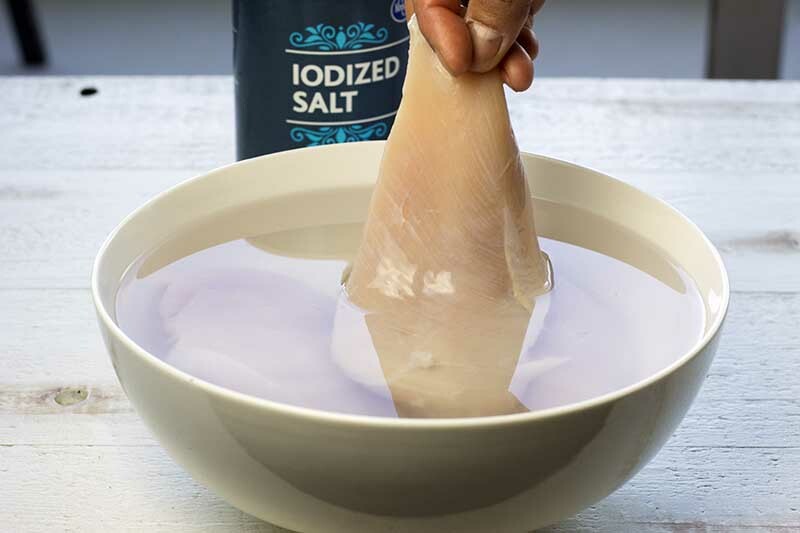 If you don’t wash off the brine, the chicken will be too salty. It shouldn’t be a problem unless one is being careless. In 50 + years of cooking not once have I cooked an unrinsed piece of chicken or turkey and never had any problems at all.